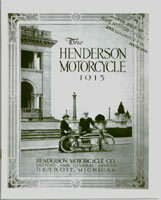 Covers the 1913 Henderson 4 models.12 pages. Very nicely illustrated with photos and drawings of the motor and rear hub.12 pages,9 x 7 inches. 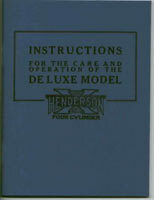 18 pages,10 x 7 inches.Shows the specifications and features of the 1918 model “H” Henderson with illustrations and cut-away views of the motor. 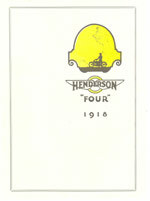 24 pages,9 x 6 inches.Parts list for the 1918-1919 Henderson and sidecar.Features drawings of the motor and transmission. 48 pages,6 1/2 x 5 inches.Instructions and specifications for starting,brakes,lubrication,magneto diagnostics,carb,transmission and electrics.With illustrations. 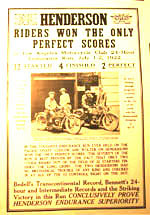 1922 Henderson Los Angeles Motorcycle Club Endurance Run poster. 32 pages.9 3/4 x 7 inches.Parts list for Henderson Deluxe Models and Sidecars.With nice illustrations of all parts and drawings of sidecar chassis. 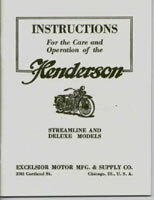 12 pages,9 1/8 x 4 inches(folded).Nicely illustrated folding brochure showing the many features of both the Super X and Henderson of 1927.With profiles and specifications and cut-away views of motors and transmissions. 1 page(2 sides),16 x 18 inches (folded out).Nicely illustrated folding brochure showing the features of the Streamline Henderson and Super X.”New lines,new features,new performance”. 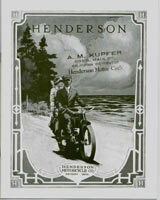 32 pages.With illustrations.Giving riding,adjustment,lubrication and repair information.